The agreeableness personality trait of the Big Five is almost exclusively defined in sociable terms. Few, if any, sources, discuss it in a solitary sense. Therefore, it’s key in showing how slanted the views of the Big Five can be. Most sources don’t have much good to say about low scores in agreeableness. 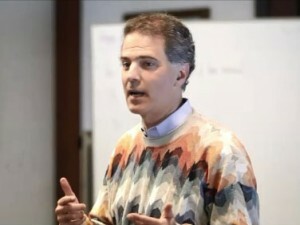 Being more successful in business and making more money are about it. They also don’t say much about the dark side of high scores. Being too nice or submissive is about it. My intro post to the Big Five, gave tips to offset biases in their descriptions. The first is to show the extreme form of the trait. That form of agreeableness is conformism. In other words, the higher the score the more likely one is to conform to the group. This means looking and behaving the same as others, being obedience to their norms. It means conforming to or accepting of their ideas with only token questioning. Emotionally, it shows up as politeness even if dishonest. When facing power, it shows up as sycophantism (brownnosing). In short, high scorers in agreeableness won’t ignite arguments or dramatic changes. However, once that change takes hold as a norm, they will convert quickly. The agreeableness personality trait has good and dark sides. Its opposite, individualism, helps to show this. The second tip is to describe what tempers extreme agreeableness in a positive light. In this case, it’s individualism. The phrase “Everyone is different” shows the connection. Different is often disagreeable. Strong social forces to conform exist. The different often get bullied. For instance, China talks about “constructing a harmonious society.” This is Orwellian doublespeak for dealing with anyone who does not conform. Individualism shows up in other ways to temper agreeableness. It’s diversity. It’s innovation. Both attack norms as new paths and behaviors. It’s contrarian ideas and thoughts. People feel it as something unique, special. 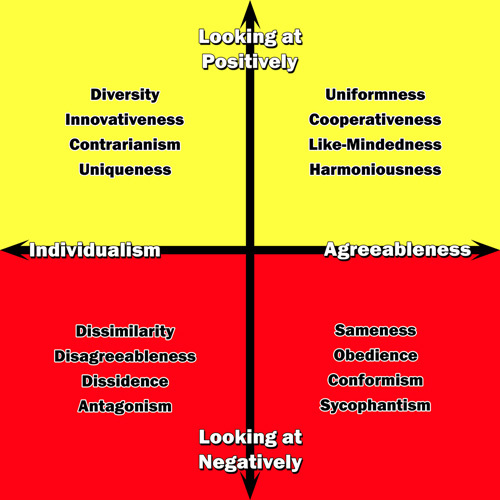 Agreeableness dominates the workplace where collaboration and consensus are key. Minimizing conflict is a goal. Keep the peace so to speak. The problem though is that this is not best for innovating, adapting and changing. For instance, research shows dissent very good for business. It means though managing diversity and making tough decisions. Waiting for consensus loses time. All of this is not easy. In terms of the agreeableness personality trait, it’s balancing it with individualism. The latter yields dissent. Here, bettering skills to assess personalities helps. It begins with grasping the pros and cons of each personality type and the way they show up in the workplace.